Other common names: Thoroughwort, thorough-stem, thorough-wax, wood boneset, teasel, agueweed, feverwort, sweating plant, crosswort, vegetable antimony, Indian sage, wild sage, tearal, wild Isaac. 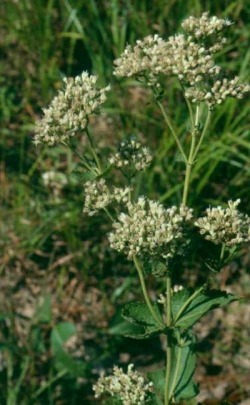 Habitat and range: Boneset is a common weed in low, wet ground, along streams, and on the edges of swamps and in thickets from Canada to Florida and west to Texas and Nebraska. Description: This plant is easily recognized by the peculiar arrangement of the leaves, which are opposite to each other, but joined together at the base, which makes it appear as though they were one, with the stem passing through the center. It is a perennial plant belonging to the aster family (Asteraceae), and is erect, growing rather tall, from 1 to 5 feet in height. The stout stems are rough hairy,and the leaves,united at the base, are rough, very prominently veined, wrinkled, dark green above, lighter green and downy beneath, lance shaped, tapering to a point, and with bluntly toothed margins. The crowded, flat-topped clusters of flowers are produced from about July to September and consist of numerous white tubular flowers united in dense heads. Collection, prices, and uses: The leaves and flowering tops, official in the United States Pharmacopoeia, are collected when the plants are in flower, stripped from the stalk, and carefully dried. They lose considerable of their weight in drying. The price per pound for boneset is about 2 cents. Boneset leaves and tops have a bitter, astringent taste and a slightly aromatic odor. They form an old and popular remedy in the treatment of fever and ague, as implied by some of the common names given to the plant. Boneset is also employed in colds, dyspepsia, jaundice, and as a tonic. In large doses it acts as an emetic and cathartic.